Can you believe it’s been three years since I wrote the first part of my AS3 Avoider Game Tutorial? Crazy! As you’ve seen, I haven’t really been updating this blog that much recently. You might not know the reason: it’s because I’m now the full editor of Activetuts+, a tutorial site for developers of browser-based apps and games. It’s the same kind of stuff I used to write about here, only I’m not the only one writing, and it’s now my actual job. This seems handy, I'll try it out! Ah, when I clicked the link I saw ‘estimated completion time: one hour’. Hi! Thanks, its very interesting. But i wonder… Dou think html5 will replace as3 and flash? I thought about learning html5 but i’m in doubt…. Nah, it won’t replace it. But it’s still interesting to learn. Big fan of your work. 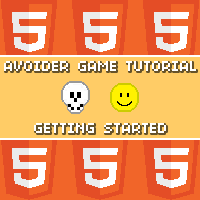 When do you think we’ll be seeing HTML5 Avoider Game Pt. 2? Thanks, Jamel! I’ve been working on it this week; I think I’ll have it online on Saturday. Will there be any updates in the html5 series? The tutorials are great as usual, thank you!